I’ve been meaning to publish a post about the Essence & Catrice blogger event I attended last week quite a few days ago, but I got really sick and lost my voice, so I couldn’t film a haul video that I promised you to include in this post. Unfortunatelly, I’m still sick and still haven’t gotten my voice back, so I decided to publish the post about the event today, and film the haul video as soon as I feel and sound better. Now back to the event. The Essence & Catrice blogger event was actually the first event I was invited to as a blogger and will always have a very special place in my heart. It more that exceeded my expectiations and I doubt that I will have an opportunity to attend an event as fabulous as this one ever again. As far as I know, this was the first (beauty) blogger-only event in Slovenia, and let me tell you, the people who organized it definitely know how to make beauty bloggers feel special. The event was held at G Super Club, which is a part of G Design Hotel located in our capital city – Ljubljana. My camera was stuggling with taking good photos inside, so I suggest you to check out some shots of the beautiful location here. When we arrived at the hotel (me being all sweaty because of the horrible humid weather), we were greeted with pink champagne and invited to take a look around the room, which was filled with makeup! 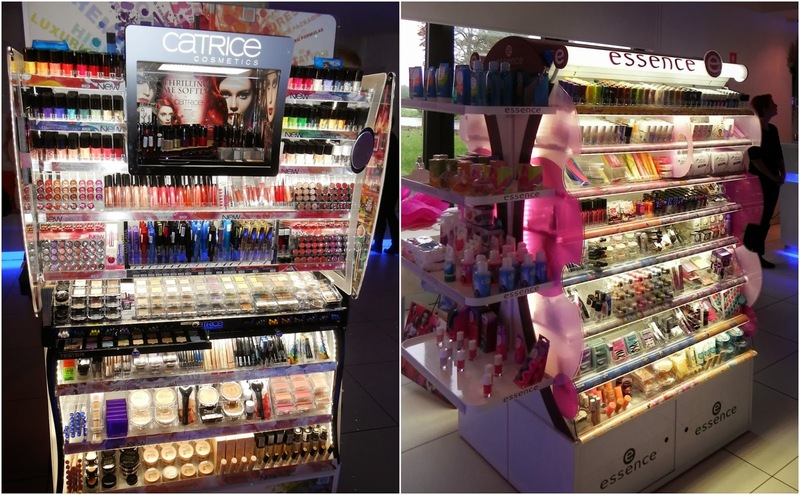 There were regular and limited edition stands of Catrice and Essence products everywhere you looked and I felt like I died and went to make-up heaven! After we took a stroll around the room and snapped some photos, we were invited to sit down and were greeted by the Slovenian brand manager, director of our distributing company and Cosnova PR manager, who came all the way from Germany and told us a few interesting things about the brands and upcoming trends through a short and sweet presentation. We were also one of the first and few people who got to see Essence’s upcoming Christmas collection before the public reveal, which was really exciting. I managed to pick up a few items from this collection as well, and I can’t wait to show you the swatches. I’m especially excited about the top coat that looks like a snow globe! The best idea ever. Once the presentation was over, we went back to browse through the stands and socialize, when all of a sudden we were told that we can take home ANYTHING we want. Yes, anything. For free. Do you know how hearing these words felt after being on a forced spending ban for the past two months?! At first I couldn’t even process the information and was just standing there looking very confused, haha. But then when I stopped feeling like a thief, I started picking up products that caught my eye or were recommended to me by other bloggers. I got a lot of fabulous stuff, and I can’t wait to show them all to you in my haul video and future posts here on my blog. Ohh, and I even managed to pick up Essence’s Gold Topper from the Metal Glam collection I’ve been searching for everywhere for the past few weeks. I went to six different drugstores, but it was sold out everywhere, so you can only imagine how excited I was to see it at the event! With all those beauty products around us, I feel like we didn’t care about food and drinks at all, but look how cute even the food looked, especially the mini cakes with Essence’s logo on them! As I have said, the event was the bomb! We were all overwhelmed by the organizers’ generosity, but all those free products were only a cherry on top. They really made us feel like princesses and the whole experience was just incredible. I really liked how I could finally browse through all of their products in peace, because when I go to a drugstore, a lot of limited edition products are already sold out and there are always so many people around the stands that it’s really hard to take a good look at everything. Oh, no. 🙁 It really is cool, very vampy! I hope you get better soon! It was all free? WOW, that is generous. I must admit when I looked at the last photo I thought you were wearing two different pairs of shoes. Thank you Jasmine! Yes, VERY generous! Oooh lucky you, this looks like a fab event! Šššš – rečeš, da so čevlji nova moda in stvar je rešena. :DUpam, da bo kmalu priložnost za ponovno srečanje.